I generally try to avoid sensationalist posts with the words “amazing!” and “miracle treatment!” in them; however, this post is going to talk about a (for real) amazing miracle treatment that helped save my diabetic dad’s foot! I’m excited to share it with you today, in the hopes that perhaps it will reach others out there in need of the information. It was a grave thing for a kid to face, but my dad is tough. He kept going, taught himself several skills, including custom cabinet making from a set of books, and has lived a long and active life. Several years ago, he developed a sore on his foot that wouldn’t heal. In spite of heavy antibiotics and various medical treatments, it grew progressively worse until he ended up having two toes amputated. After the surgery, he had a team of excellent wound care doctors and was eventually able to resume his normal high energy activities. Last year, he developed a sore on the same foot, just like the one that caused him to lose those two toes. For eight months, the standard medical treatments and antibiotics failed to help and it looked like he would need to be referred to a surgeon again. One day, someone told him about their experience with treating a bad wound with raw honey. At that point, he was willing to try most anything. Being the go-to health nut with a ready stash of raw honey in the family, I was asked about it. I printed it off and brought the papers over to his house along with a jar of raw honey from my father-in-law’s beehives. My dad took off his medicated bandage and started the honey treatment that very visit. Just a few weeks after I took the second photo, his doctor declared that his foot was healed. He tried some expensive manuka honey on the new sore, but it actually made it worse. (That can happen, but not always. THIS STUDY hints to a possible reason as to why.) He decided to try medical treatments again (that didn’t work, again) then circled back to local raw honey. Then, he fell and broke his hip opening up a new set of problems! So, what I’m saying is, if you have a diabetic ulcer/sore you should absolutely be under the care of a medical professional. This is just a retelling of a home remedy that helped my dad and should not be construed as medical advice for your particular situation. Since it’s so very important, I want to reiterate it once more: If you have a diabetic sore or ulcer, get your doctor’s blessing before attempting ANY home remedy. Also, don’t discount this as only being a treatment for diabetics. 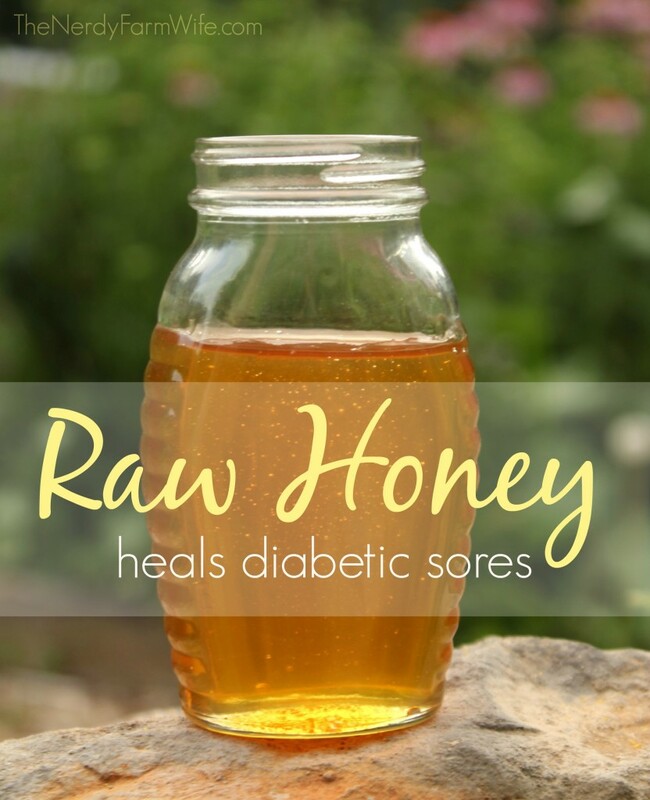 Raw honey excels at healing many types of slow-to-heal wounds, such as bed sores. If you enjoyed this post, let’s keep in touch! Subscribe to my newsletter (HERE) to receive my best herbal projects, recipes & soap making ideas delivered straight to your inbox each month. No spam ever, unsubscribe at any time. Tagged diabetes, honey, raw honey. Bookmark the permalink. This is so great! I’m a nursing student and have seen many sores like this, and I wonder if I’d ever be able to incorporate this into discussions with my patients. I’m not sure if it’s my place to do it, legally, but I feel like if I tell them to ask their doctor about it, it should be fine! It’s so heartbreaking to see so many people lose body parts to diabetes, or have terrible bed sores that never heal. Hi Steff, I imagine that’s very hard to see. I hope you do find a way to share with your patients! I saw your publishment about your dad’s foot care.i have the same problem with my mother’s foot..what i should do?where do i get the raw honey? Hi Sarmala! If you’re in the U.S., look for raw (or unheated) honey at your local farmer’s market or grocery store, especially if it has a healthy foods section. I hope that your mother’s foot heals quickly and that she feels better soon! I have been in pain with this diabetic soars for 4 yrs now and they want to amputate my toes so I am going to try this ASAP. I also have something called charcot disease in my foot as well so I am going to give it a try. I have just about run out of any antibiotics to take so wish me luck. Hi Krista! 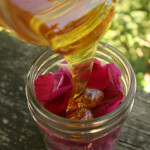 I hope that the honey is helpful for you & would love to hear an update of how it goes! Krista , I have Charcot Marie tooth disease as well with a sore on my foot that is refusing to heal all the way…has the raw honey helped your foot sores? Hi Swadha! Unfortunately, there’s no way to really know how much or if it will help someone until they try it, with their doctor’s blessing. I hope that it does help for you though! I’m glad you brought up the topic of using g local raw honey for healing. My mother in law had a very bad spider bite, and the poison ate away tissue (the size of a quarter), it looked bad . She hates doctors but finally went. They put her on antibiotics for weeks, which did nothing more than cause major problems with her stomach because it killed her good flora. But after many frustrating weeks she turned to a herbal doctor that prescribed local raw honey. After only a week she saw remarkable healing. Although she did mention when she first added it to the wound it wasn’t a comfortable feeling. I’ve used it for years on small scratches and it always helped. I’m so happy that the raw honey helped her spider bite! My dad found that taking a spoonful a day helped his stomach feel better, in general. Honey is a wonderful substance! This is almost 3 years later and I need to know if the study got published?? I work in the lab too!! My dad is diabetic with bad bad sores, talking amputation and is coming home with home health and MRSA from a nursing home. Not expecting miracles, but would love to hear follow up to the study and others! Thank you for this information. I am not a diabetic but I have been in the same position since August (it is 6/26). So far, even though I go to a specialist, nothing has worked. I will get their permission next week. I have had horrible side effects from the antibiotics. My dad was diagnosed as a diabetic in the 1950’s as well. He had a foot sore for over a year. I wish we had known about this. Hi Ana, I’m so sorry that you’re having the same problem. I hope the honey will help you as much as it helped my dad! I am thrilled to see this information on your blog! I am a diabetic, as well as having had MRSA, and having super-sensitive skin in general. It’s was a huge pain (literally) to deal with until I started using a skinwash I make which also incorporates raw, local, organic honey. Honey is a wonderful healer and slowly breaks down into a form of hydrogen peroxide on the skin, which is part of what helps with healing. I’d be more than happy to share the recipe with you if you would like to try it…and, no, I’m not trying to sell or peddle anything; I often make it for others who want to try it and give them the recipe as well. Hi Jacqueline, Your honey skin wash sounds great – I’d love to hear more about the recipe. Thanks! Jacqueline, I am interested in your homeopathic skin wash. I am a diabetic and my husband, also. If you are willing to share it, I will be appreciative. We have our own bees would love the recipe, I am a diabetic my mother lost her leg. She was diabetic also. It scars me so bad when I get any little thing wrong with my feet. The wash sounds like a great Idea. I would love to try all natural honey skin wash. I live in the UK & my 91yr old Mum has just developed a ulcer on her toe. She’s had antibiotics & reg. dressings from GP surgery….then I read your post. Would be grateful for your skin wash recipe. Jacqueline Mitchell i am a diabetic and i just now have the foot sores i would love to get your recipe for the skinwash if you could pass it on to me I would love to try it. Hi Leslie! I hope your aunt never has trouble with sores, but I’m glad you have the information to share with her if needed! Hi Jan! It’s really a very simple recipe, that requires a few ingredients and a bottle which can be tightly lidded. 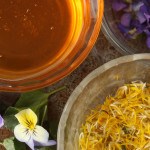 Mix 1/2 c. Each of grated, organic soap for sensitive skin, hydrogen peroxide, olive oil, and local organic honey with 10 drops of tea tree oil and fill the bottle to within one inch of the top with warm water. Shake well until ingredients are well incorporated, and shake lightly before each use. It’s the only ‘soap’ I use; if a problem seems to be arising I’ll wash the area twice daily and it nips it in the bud! I found your recipe Jacqueline but I don’t see what size bottle am I to use? Since you say I am to fill the bottle the rest of the way with water. I would like to know bottle size since we do not know how much water to add. Does it need to be a dark colored bottle. Also the hydrogen peroxide will not lose effectiveness? Hi my best friend has diabetes and had toes and portion of foot removed in 2016. The incision healed but has opened at the incision line and formed an ulcer. He has been careful to clean and cover the area but it will not close and has a terrible odor. I have been reading about the Manuka honey for treatment and want to thank you for confirming my idea of using local honey. Will also try making wash. Hoping this works as he is very conscious of the odor and ulcer needs to heal. Thank you again. Hi Karen! I hope that the honey helps your friend! I’d love to hear any update on how it goes too, if you get a chance. Best wishes for a full recovery! Thank You Jacqueline Mitchell for sharing. GOD truly bless you for helping others. Thanks Karen Lee – I’m glad you enjoyed reading it! I have a friend who was doing missionary work in Africa. She got a 3rd degree sunburn with blisters the size of small saucers. The local villagers began slathering her with honey and told her not to stop doing it till all blisters were gone. She is home now and it worked well. Little scarring and never any infection. That’s wonderful that honey helps severe sunburn too. Thanks for sharing that great story; I’m glad your friend is doing better! What is raw honey??? I didnnt know anu honey was cooked or processed. How is RAW honey different from other honey. That is really interesting! I hope the product continues to work well for your patients! My friend’s diabetic mother used Medihoney on her ulcers and it worked wonders. That is so interesting to know! I think it’s great that we’ve progressed to where it’s more common to respect someone’s cultural and religious beliefs these days. What a clever mom too! ;) I’m happy that the little boy healed up quickly – what a wonderful example of how traditional remedies, modern medicine, and loving care can harmoniously coexist! my dad is a veteran and a diabetic 92 years old and he has some foot sores that a nurse treats with medi honey, all healed so far..amazing stuff. Hi Dorine, That’s so great that the medi honey is working well for your father! I also am a diabetic. Eight years ago, my son kicked me in karate class. I had a large bruise on my leg for two months that would not heel and started to ulcerate. I began to search and also found the honey study and history of honey used on battlefields in Civil War and WWI. I tried it using same instructions. It not only healed the sore, but it also reduced the bruise swelling. Today I only have discoloration left from the intense heat and redness from the infection. I tell people to do the research themselves and look for different websites that to this subject and not just take my word for it. Wow! 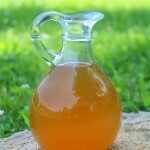 That’s wonderful that you were able to get such good results and so much healing from honey! Who do I contact to find local honey? I bought honey at the farmer’s market, bit don’t know if it’s raw. The farmer’s market is the best place to buy raw honey, so I suspect it is! You can double check with them next time you go to be sure though. Health food stores usually carry local honey. So happy to find this post. I watched my Dad struggle with sores on his feet that would not heal due to diabetes and would loved to have known this at that time. I discovered the healing properties of honey recently when I burned the inside of my wrist, rather badly, with steam from a teapot. Because I didn’t have any kind of burn cream, I quickly did a web search and found a tip to mix AC vinegar and honey and coat the burn with it. I did that and wrapped it in gauze and I awoke the next morning with no trace of a burn. I’m a true believer in using honey for wound treatment!! I’m sorry about your dad going through that – I know it’s tough to watch a loved one suffer. I am most definitely trying honey on the next burn I get. We use a woodstove in the winter to heat our house and I’m always getting burns. My mom taught me to put an egg white on them (trick she read in Prevention magazine forty years ago) – it works great to take the sting right out, but still leaves a red mark. Not looking forward to winter OR more burns, but looking forward to seeing how honey works in that capacity! Good to know about the egg white. The vinegar mixed with honey also helped provide a cooling effect but I will give the egg white a try next time, too! Honey also works on animals! We had a horse who badly ripped his leg on barbed wire. Honey cured his fist-sized wound after other treatments failed. That’s great to know Jane! I’m so glad that it helped your horse’s leg! I have been using honey as long as I can remember. My dad used to put it and butterfly stitches on deeper cuts and just honey on smaller cuts. We also used it on farm animals because it kept the flies out of wounds and aided healing with minimal scarring. My husband used to make fun of me until it started getting more popular and he started seeing it on news reports. A few years back my daughter even did a research paper on it and found many studies on honey and MRSA and burn treatment. I even use it to bake with instead of sugar (not when you have toddlers though) a lot of the time. :) I love your website!!! Hi Lisa! I’m not sure why it burns, honey is usually soothing. You may want to check with your doctor about that or try a different type, just to see the difference. You could also look into seeing a naturopath or holistic doctor. You probably have many things going on that need addressing and then perhaps your body can heal better on its own. I sure hope you find something that helps you feel better! My mom had a diabetic sore on her leg that would not heal. We went through wound care clinics heavy antibiotics ect…nothing worked…I knew that honey has been used for centuries for healing wounds…so we decided (with her Dr’s approval) to try this route…we used honey from my dad’s hives and we applied it twice a day for a month. Boom healed ….Her Dr was amazed because for 6 months there had been no change no matter how much modern medicine that was thrown at. I am so happy to hear about your Mom’s great experience with honey. It’s such a wonder worker! Hi Michelle, I’m so sorry about your husband’s health problems! My dad finally did go back and get the bone removed from his foot (the one I mentioned was causing pressure on the spot shown making it worse) and it healed back up nicely too. Raw honey has been wonderful for him and I truly hope it helps your husband as well. hi Jan. My mother had bedsores on her ankles shortly before she passed away, so painful & nothing helped. My husband had a bedsore on hip earlier this year before he passed away. nothing helped. Wish I’d known of the raw honey treatment. About 5 years ago I got either lymphodema or cellulitis on my leg, was hospitalized & couldn’t work for more than 2 months, silver bandage finally healed it. I wonder if raw honey would have worked? Hi Pat! I’m so sorry to hear of the painful sores and conditions that you and your loved ones have suffered. I think back at times I wish I would’ve known when my dad had other sores and wounds that wouldn’t heal too. I’m glad we know now though and hopefully, as time goes on, more people will know about the benefits of honey and it may save some of them some pain and suffering. I glad that you’re leg is better and hope you have continued good health! It would be very nice if there was a social media “share” option so we could forward this to our friends and family. The article is very interesting and I know it to be true because my mother had a diabetic sore that woulld not heal and I used raw honey to heal it. Hi Julee, Thanks for the great feedback! I’m working on updating my site and that is really helpful to know – I’ll add it to my list of changes to make! I’m so happy to hear that raw honey helped your mother! Hi Mary, I’m happy that you found the information helpful! Thanks for sharing with your sister too! I read the post about how honey helped your Dad with his foot ulcer, my husband has lost four toes to chronic ulcers and infections… and recently developed a new small one. He is under an excellent doctors care… but the cost and time is getting frustrating. I am a big believer in God’s natural resources as well as medicine… and have used raw honey for allergies before…. we are going to give this a shot… will keep you posted on how it goes but I am hopeful and excited! Hi Cori, I really hope that the honey helps your husband! Please keep me posted! I just bought organic, raw honey from Costco and have a small ulcer pencil eraser size and very superficial and a scratch on my leg. I will see how the scratch heels first. I will also look into medihoney too. Hi Dave, I hope that you find the raw honey helps! Keep us posted! The Medihoney I end up buy worked awesome. With 24 huge improvement. Changing it 2-3 times daily. After 48 hours- gone!! That is after I tried triple antibiotic ointments for a week and no change. I’m sold. Medihoney. What type, Gel or paste, or bandage ? With or without certain additives? Certain brand? The ingredients don’t sound expensive but it looks like companies are taking advantage with some outrageous pricing. Jan, it has been almost two years since I learned of this remarkable information you helped convince me to try. I had a tiny perfectly circular shaped small ulcer on the bottom front of my foot. Smaller than a pencil eraser. I tried triple antibiotics ointment multipletimes a day for 3-4 days with no change at all. I tried Medihoney twice daily same treatment and it completely healed in about 2 days. Amazed. About 6-12 months later I got another one but smaller. I couldn’t find the Medihoney so I used raw organic honey from Costo and it healed within two days. I’m sold!! Thank you again. Hi Kathy, I hope that the Medihoney helps your husband out! It’s also important for him to stay off his feet while things heal up. (That was SO hard for my dad since he’s very active normally!) Best of luck to you both! I tried this with an ulcer on my husband’s leg. It works!!! Thank you so much for sharing your recipe for healing! How often did you change the bandage? Hi my dad cut his thumb nail littl deeply it started bleeding , he s diabetic am too much worry abt him am thinking to use honey to heal it, can i buy raw honey from super markets. Hi Som, You might be able to! Or, if you have farmer’s markets in your area, they may have some too. I hope your dad’s thumb feels better soon! Hi Jeff! I’m not familiar with Silver Shield Gel, but looking it up, it could be a good cleanser to use before applying the raw honey, instead of using alcohol wipes like my dad did. Just double check treatment ideas with a doctor to be on the safe side. I hope it helps if you try it out! Keep me posted! My husband is a diabetic he had one leg amputated, now the other one has sores and they are not healing I going to tell the doctor about raw honey or Medihoney which one is more affect. Thank u for all the information. Hi Merida! My dad had the best luck with local, raw honey, but I’ve heard of others that had good luck with Medihoney. I hope that one of those is able to help your husband! So… You need to let us know how to buy raw honey from your father-in-law!! My husband has been fighting a cellulitis ulcer with staph infection on the bottom of his toe for about 3 months now. We found your post and started on this some time back and his toe was getting better. However a new Dr. (3rd one) he saw thought he needed to check in to the hospital via ER and get an MRI and receive intravenous antibiotic. When they did another Xray the ER Dr. said an MRI was not necessary because the xray confirmed that the infection was not in the bone and blood tests confirmed he is not diabetic…and it looked to him like the sore was “on the mend” just as we thought, but that he needed to keep his appointment with the wound clinic (another new Dr., actually nurse practitioner). So he goes to the new clinic and the NP doesn’t like that the new tissue forming on the toe is puffed up so she cuts the new tissue off. Just this last week he saw the Dr at the wound clinic and he did not cut on the toe. Only this Dr. and the ER Dr did not cut (debridement) on the toe. Every time they cut it seems we go backwards in healing. But they put him on some other kind of treatment and he stopped the honey regimen. Now they say he has MRSA staph and this newest Dr. Has suggested cutting off the end of the toe. Because he feels like he needs the antibiotics he keeps going back… and getting set back every time. A couple of the Drs he has seen have given him medihoney but they only try it for a few days and then they change up. Im fed up with all of their medical “practice”. tgwy would rather cut his toe off then cut and cut some more. How can making a bigger wound help heal??? He is going back to this regimen which was actually working. Unfortunately he has another appointment in 2 weeks. I haven’t been able to go with him before but I think I will go and be insistent that they so not cut on him and let the thing heal. Hi Karla, I’m so sorry to hear about all that your husband has been going through! Before he started the honey, my dad had some growth cut away too a few times. The doctors seemed to feel it was necessary, though from our perspective all it did was to make it red and angry looking and it certainly didn’t improve things. After he started the honey, things healed up enough before his next visit so they stopped cutting on it. I hope that your husband is able to see improvement very soon! Thank you. I’m praying to God that he is well soon, too. I’m just thankful we found your post, and also I read the link, and printed it for hubby to read. I Just wondering how your husband got on? My mums going through the exact same thing and no further forward with hospitals. They are a nightmare. Hi , I’m sagar my father is suffering from diabetic from past 10 years , but there’s was a bubble like sore on his finger then the doctor try to remove tat and they cleaned and bandaged it but day to day condition , the hole in the finger not healing instead of tat its going still deep , I’m really confused !!! Hi Sagar, I’m so sorry about your father’s sore on his finger! I hope that he’s able to try the honey and that he heals up quickly! Very helpful information, will definitely look for the honey & try. Thank you. My fatherinlaw feĺl down from bus & a rod scratched his heg n became heavy wound. He is a diabetic patient and its almost 1 month over his wound is not getting rid. What is the remedy for it? Hi Naji, I’m so sorry to hear about your father-in-law! Has he been to his doctor or another medical professional to see what they suggest? If so, you can ask them about using the honey just to double check that it doesn’t go against any other treatments he has going on. I hope that he heals up quickly! Hi Naji, I’m so sorry to hear that! I’m glad he got checked by a doctor though. Maybe he’ll get a chance to try the honey out! I hope that he heals up and feels better soon!! any wound would get healed after applying bee’s honey. After reading this interesting cure, I applied bee’s honey on my wound caused by an accident. It was an excellent cure. My wound got healed as a result. Bee’s honey on wounds is an Ayurvedic medicine. My wife used to apply bee’s honey on her gum as a cure for Gingivitis, which causes lesions (wounds) that affect the gums. Hi I took care of elderly for 20 years in my home. I had a very nice lady come to me from a nursing home. She had to pressure sores on bothe sides of her hips. The doctors had tried everything but they just kept getting worse. So I had a very wise Physicians Assistant come to see her. He told me to buy some raw honey and tea tree oil. I started using this and within a week you could see improvement. Both sides eventually healed. From that point on I used it on all the wounds on the elderly and it just worked wonderfully. Hi Narmatha! I hope that the honey helps your father! I wish I had more information to share that could help further, but everything I know about the topic so far I already wrote in the article. (Will be sure to update though if I find new information!) Sending many good wishes for a speedy recovery for your father! Hi,my boyfriend has type 2 diabetes and now a hole under his foot that wouldnt heal but keeps draining light red fluid. A blister has also formed around where his toes were amputated. How well do you think the honey remedy will work. I also read somewhere about using sugar. Do we have to find a way of treating the honey with antiseptic? Hi J’ello! I’m sorry to hear about your boyfriend’s foot! The honey doesn’t need to be treated with an antiseptic; it can be used in its natural state. As long as his doctor is okay with it, I think it would definitely be worth a try to see if it will help him. Since I wrote this article I’ve heard from so many people who have had positive experiences with the honey. The main thing is to keep his doctor in the loop. Best wishes for his healing! Hello Jan, my name is Brad. I am a Type 1 diabetic with 2 silver dollar sized diabetic ulcers on my right foot, the foot is also very swollen and I probably have underlying bone issues as well. I am currently working with Dr’s to figure it all out but just had a quick question as to how safe honey is on deep wounds. This is no shallow creek so to speak, its more of a deep lake. I am looking into medihoney and wondering what to try first. They have patches and paste and ointment. Also how much raw honey should I try as I would like to try that first but dont know how much to apply in mg or G. I would also like to take the time to thank you for all that you do. The world needs more people like you. :) Great post and I hope you continue to help others with your knowledge. I had never heard of this before I read your article and I am so sorry to hear about your dads difficulties. I understand them completely. Hi Brad! Thanks for the kind words! :) I’m sorry to hear about your foot. It’s my understanding that in the case of deep wounds, you want to actually fill them in with the honey before putting on the dressing, to make sure there’s good surface contact, but that’s just my layman’s understanding. I’m not really sure on an exact amount of raw honey to try, as far as mg or g, since my mom used just enough to cover the area. As the sore shrunk, she needed less. If I recall correctly, I think he went through less than 2 small bottles of honey (the size shown in the photo of this article) & had plenty leftover so he started taking a spoonful a day for allergies. (He reported it made him feel better too, doing that.) The only risk of putting too much honey on is that it could ooze out of the bandage and be messy. From everything I’ve read, it’s completely safe to try otherwise (assuming your doctor is still kept in the loop.) My dad never hasn’t tried the medihoney, so I’m less familiar with the various forms they offer. You could try the raw honey for a week or two and see what happens, while you research the medihoney. In the case of my dad, he saw some pretty visible improvement in a fairly short time. I hope the case is true for you as well & that you soon reach full healing! How long does it take.. until you remove the gauze from the foot?? Hi Mabe! After putting the honey on the sore, my mom put the gauze on my dad’s foot and it stayed on for the whole day. In the evening, while he propped up his foot and watched tv, the gauze was taken off and kept off for an hour. Then she cleaned the area, reapplied the honey & put on new gauze. That gauze stayed on all night, until the next morning, then she repeated the process with new gauze. So, other than two hours a day, the gauze stayed on to keep the honey from rubbing off and to protect the wound. Hi there. My husband has been using manuka honey on his ulcer, and has improved so so much. Almost shut. But any suggestions on what to do in the very last stage to finally shut? I expected it to be totally close a couple weeks ago but seems like the last part is taking long. The opening is like side of a quarter. And it’s smaller than half of a dime.any suggestions? Hi Alicia! I’m so happy to hear that the honey has improved things, but am sorry that it hasn’t quite closed up yet. I wish I had better advice, but I’m really not sure which option is the best. It may just need more time. Next visit to my mom, I’ll ask her if they ran into that problem & if so what they did. Best wishes for a speedier healing! My second question is if it would be wise to let more air hit it? Because I hear it should be kept moist to heal better. It seems like now should just let it air dry and let it scab. I just don’t want to do the wrong thing. Has your father been evaluated for Charcot foot? I have it, it can often develop in those with diabetes. It can be debilitating if not addressed soon enough. You might think about looking for a local specialist, not many doctors are truly experienced with the condition. Hi Natalie! I’m not sure, but I’ll definitely ask him about it. Thanks for the information! I wonder if that works in wounds that there was infection before. My dad’s toe was infected and doctor removed lots of tissue and part of bone and has been for almost a year with antibiotics in vein vancomycin and cilostal for his blood circulation and many other medications, he is 83 years old, diabetic and I feel so bad to see that the wound does not heal. Doctor only prescribed antibiotics daily and he goes to be changed the gauze once a week, but nothing is healing. Hi Eliana! I’m so sorry to hear about your dad’s toe. If he’s able to try the honey, I’d love to hear how it does for him. Best wishes for all! Hi John! I’m so sorry to hear about your foot & the frustrations with your treatment! I hope that the raw honey makes a difference for you – keep us posted on how you’re doing! Thank You Jan for sharing. GOD truly bless you for helping others. Hi Juliet, I hope it helps & best wishes for your recovery! Thanks for all this information. My husband was diagnosed with Type 1 Diabetes 8 months ago. He has a cut on his thumb that isn’t healing properly and I want to use honey so it will totally heal. Do you know if applying honey to a wound will cause a spike in blood sugar readings? Hi Carol! It didn’t cause my dad’s blood sugar to spike, and as far as I know it shouldn’t, but you can monitor sugar levels and double check with his doctor if you notice anything concerning. I hope it helps his thumb heal! Since vinegar contains acetic acid (very dilute), the same thought may carry over, but I’m just not sure. It’s an interesting idea to pursue though! Hi Mitchell! I hope that it helps – let us know how it goes!